Located in Nishiki Market, Nishiki Ichiha offers Matcha sweets and dishes. Their signature dessert is “Nishiki Ichiha fondue” which comes in the three-story box. When you open the drawer, small size sweets will appear and you put it in the Matcha fondue on top of the box. This shop has a beautiful garden in the back of the room, so you may enjoy the delicate taste of Matcha and also the garden at the same time. 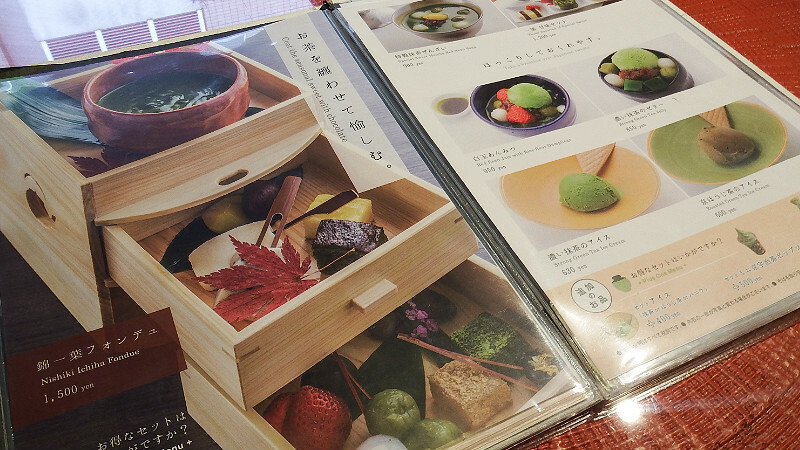 It is great to note that there are many Matcha dessert menus and also Matcha noodles. As it is located in Nishiki Market, you may enjoy the atmosphere of traditional Japanese market as well. I bet that you have never seen this kind of Matcha dessert. This is a Matcha fondue and there are small size sweets in every drawer. You need to dip them into the Matcha chocolate sauce in the beautiful bowl. Our favorite was the black soybeans with gold foil on top. When you dip them, they beautifully change their color into a bright green. It tastes very rich as the sweet black soybeans and Matcha match well. Look at this volume of this pancake! There are 2 pieces of Matcha flavor pancakes with whip cream on top. There are some sweet red beans and sweet potatoes on their side. The pancake is very fluffy and the flavor of Matcha goes very well with the light taste of whip cream. You can choose a drink either specially selected green tea (hot or cold) or Matcha au Lait (hot or cold). If you eat this parfait, you cannot hold “Mmmm” sound as it is so delicious! There are some rice-flour dumplings and red beans source on the bottom and Matcha jellies and fresh strawberries are well matched. The Matcha ice cream is gradually melting and soaked into Matcha flavor pancakes. There are also some other flavors such as roasted green tea, rice-flour dumplings and wheat gluten, so please try other flavors as well! If you would like to walk around Nishiki Market, this is what we recommend! There also is a takeout menu, so you can enjoy this popcorn ice cream while strolling Nishiki Market. If you choose the mix flavor popcorns, you can taste different kinds of popcorns. They are: roasted green tea, brown rice tea and green tea flavors. Please choose your favorite dessert from the menu. As the English menu is written under Japanese menu, it is easy to order. There are pictures next to the menu, so it is also easy to imagine what kind of dessert they would offer. If you would like to stroll around Nishiki Market, you can order a popcorn ice cream to go! The matcha popcorn is sweet but a little salty at the same time, offering your tongue a Japanese-Western sweet and salty sensation like no other. I would like to watch a movie while eating their matcha popcorn. 10-minute walk from Hankyu Kawaramachi Stn. If you like the tableware in this shop, you can also purchase it here! As English menu is written under Japanese menu, you will be able to order easily. There are some staff who speak English, so please feel free to ask any questions.